One aspect of D&D 4th Ed. that I like a lot is its simplicity in letting you make the game as customized as you want, both rules wise and story/role-playing wise. The other day on twitter I went as far as calling it “possibly the most abstract D&D yet”, and some people didn’t really understand what I meant, because admittedly, it’s hard to see something as abstract when you are holding 15 minion minis in your hand, but I’ll try to explain. As DM’s, we have tools in our arsenal to let us carve out a custom game made to the type of campaign we want to run, with minimal effort. Let’s look at monsters first. The way that monsters are setup in 4th ed., they are all power based, their equipment and armor (if the monster is wearing any) being a little inconsequential. If the guy attacks at a +10, then whether or not he’s holding the falchion that his stat block says he is doesn’t really matter, just know that the +10 is fine for a monster of his level. So if you really like some of the attacks this monster does, and are looking to create an original guy, don’t sweat the details. Take this guy and re-skin his name and powers. Build something creative without having to worry about mechanics. Let’s look at the following monsters as an example, let’s turn a drow sniper into a Dilophosaurus spitter from Jurassic Park. Odd right? But it should be easy. Can we do it? Yeah, easy. So what did I do? Not much. I didn’t touch the numbers at all. I replaced the drow name every time it came up with “spitter”, and added a blinding effect to the poison, because the movie showed that this happened. For game mechanic purposes it is the same monster, just reskinned to be a spitting dinosaur. Your players will never know that this was a drow sniper, and the balance of the game does not suffer. Now what about keywords? Well, you can use keywords to more or less create the type of campaign you’d like. Let’s assume you want to create a world where all wizards are winter mages. All you have to do is tinker with the wizard powers’ keywords. The idea is that you are taking the power, adding a specific type of damage to its keywords, in this case cold, and reflavoring it for your needs. “Magic Missile” can now be called “Icy Frosty Laser Beam” and you have a winter wizard. Silly example, but the idea behind it isn’t. And what about the abstraction thing I mentioned at the beginning of the article? Well, let me give you my opinion. A lot has been said about 4e’s power-based characters, and how they are cookie cutters and all that. Well, that is the furthest from the truth, as long as the DM running the game, along with the players, put a small amount of effort behind their powers. Who says that every instance of “Righteous Brand” has to look the same for every cleric in the universe? Remember, the Character doesn’t name this attack, that’s just for bookkeeping purposes. His version of the attack can look like whatever he wants it to look like. Take advantage of that. Have character creation also become an exercise in creating and imagining neat power descriptions. This, coupled with the relative ease in reskinning monsters in no-time, along with fiddling with keywords, lets you make whatever game you want rather quickly. The tools are all there, you just need to put on your creative hat in order to use them. This is exactly why DnD4 has no appeal to me. Monsters are just “stuff” held together by keywords. I was never able to figure out why DnD4 left such a bad taste in my mouth, but you put your finger on it exactly. That isn’t to say the DnD4 doesn’t have its place and followers. I just don’t like thinking that abstractly (as the GM) and then simplifying what i perceive (as a player). Just not for me. It really is a case of “different strokes for different folks”, because this is exactly one of the reasons i like it so much. It lets my creativity take over without having to worry about mechanics. catdragon: By “stuff” do you mean attack mechanics, movement types/rates, resistances, and vulnerabilities? Because if you do, I’m not clear on what else you expect a monster to be. I mean, to use the example here, if you think the dinosaur spitter is still too much like the drow sniper, the Monster Builder lets you add a new attack (razor claw, maybe) or a new movement type (jump 6 squares as a move action, maybe) or a group attack enhancement (bonuses to hit/dam when they attack in groups). Are you suggesting that various types of monsters should always be more defined and have certain characteristics? If so, D&D4e lets you do that to your heart’s content. It’s not a question of thinking abstractly and simplifying for the player. It’s a question of nearly limitless mechanical customization and flavor choice in the service of whatever story the DM and the PC are trying to tell. D&D4e is the least cumbersome system I’ve seen that still retains enough of a crunchy framework for players and the DM to know what it is they can and can’t do. The mechanics of a monster in DnD4 is a matter of “it does this and we call it that.” Another monster at the same level of challenge would have identical powers but we would call those powers “that.” To me that is too simple. As newbiedm said, it’s a matter of taste. To me it is too abstract, and thus too simple, to be enjoyable. The cool thing about reskinning when you play, is that you realize it’s all about the description and your players’ imaginations. What do they “see” when you describe the situation. Having mechanical components that are portable means it is easier for me, as a DM to rule on the fly. The story (what we’re here for, IMO) flows, and that’s golden. Catdragon may prefer the ornate uniqueness of lovingly-crafted monsters and effects that are mechanically unique (thus requiring more prep, and perhaps a more savvy player, or at least one who is better read.) I guess it boils down to your game priorities. For some folks “knowing the code” and how to write it is the fun, for others, we just wanna use the program. @catdragon – Really, how is this any different than any other edition of D&D? Need a big bad kobold for OD&D? Use a bugbear and call it a kobold. I’m not going to contribute to the argument here, but I would like to say that I totally agree with this post. As a DM I find the abstraction in 4e liberating because I can re-skin freely and easily create the exact foe I’m looking for. To be fair, this is somewhat true of all versions of D&D. There’s no need to make a whole new NPC for a modified published adventure: just replace the racial abilities for the race you want. However, no other version is as systematized to help the DM in this way, as David neatly pointed out. I’ve done this a few times. Even with just humanoid characters (like bandits or guards) it can make a world of difference to the perceptions of the players and thus there immersion/involvement in the game world. It’s easier on me when I GM too. Instead of looking around through my books or Adventure Tools for specific kinds of monsters, I can take the most ~interesting~ monster then flavor it and mechanically tweak it appropriate to the encounter. It’s something I’ve done with previous editions as well, except much easier and simpler to do in 4e. I’ve found that reskinning monsters has helped keep it fresh, I’ve turned familiar/boring creatures like kobolds/goblins into constructs by just tweaking a few keywords. The balance was still there and my players reacted differently to the constructs then they do toward the real monsters. How do you explain the re-skinned Darkfire power, in narrative terms? In the case of the drow, he/she is outlining their target in fire that makes them easier to hit. How do you explain what the spitter is doing that achieves the same effect? I’d vote eliminate. Your explanation doesn’t cover why it’s an attack against Reflex (yours sounds like vs. Will) and it also doesn’t explain why the target would grant CA to everyone and not just to the attacking spitter. I did say it should have been vs. will. And if explaining certain things were the case, many monsters would be in trouble. How about that illithid in the Underdark book that eats brains at range? Wtf is up with that? This does bring up a good point though, monsters as published should have a better description of what it is their powers do. I’ve heard through the grapevine that MM3 will address this a bit. An older guy I play 4e with has never played anything but OD&D (which he’s been doing consistently since the ’70s), and certainly has his gripes about this system. One of his complaints is the lack of thought given to monster ecology. Open up any Monster(ous) Manual from a previous edition, and you’ll see over half of the entry devoted to the sorts of environments the creature lives in, what their social groups are like, all that. Now you get a statblock, a paragraph or two to read to the players on a successful monster knowledge check, and little else. Personally, I like it better this way. As a DM, I can thumb through the MM with fewer preconceived notions leaping at me from the page. A goblin tribe functions how I say a goblin tribe functions, and there’s nothing to say the next one encountered won’t have an entirely different culture, etc. I like have dozens of example goblins to pick from (there are seriously a lot of goblinoids). I like that if I want to throw in an outcast tribe of goblins twisted by the shadowfell, I can use shader-kai, virtual unmodified, and the players will never know. I don’t think abstract is simple. In fact, the more abstract the monster entries, the more work the DM has to do to make the creatures come alive. But that also means more possibilities. Great example! That really can open up the game. I’d like to see reskinning be an option in the character builder. Being able to print out a “legit” character with renamed powers and reworded flavor text would be wonderful. I’ve also thought 4e would make a great superhero game, and this would make that all the better. I also like to use the monster builder to harvest individual attacks/abilities from various monsters and then compile them into a single creature, when you can’t find the “best fit” to re-skin. …who forgets the address to their own blog!? Apologies, apparently my first post didn’t make it through the interwebs. Before I misspelled my own blog address, what I said was that this is exactly the reason I love 4e. A solid framework gives you so much freedom as a player and DM. I’m always encouraging my players to change the flavortext of their PCs. I even put forward two ‘flavor-classes’ (classes in fluff alone) on the blog I mentioned above, a blog dedicated to fluff in all it’s glory. WotC has gotten off the high horse of ‘written in stone’ rules. They recognized folks were making tons of house rules. Why fight it? Why not make a game that has a fair amount of adaptability. Give some frameworks (exp budget, expected defenses and damage output/lvl), and let the DM run with it. It works. @Captain spud, hey spud, I’ve wanted to run a supes game but M&M & GURPS seem to complicated. Can you give me a few exaples of how your players are creating characters ie how do they pick powers ? are they using 4e ability schools? How do you run combat with char with superspeed & flight? 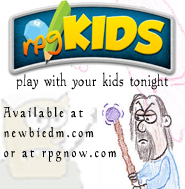 @Manny, M&M is a brilliant superhero roleplaying game. I’m not the greatest rules lawyer at the best of times, but once you get past the learning curve, the possibilities are almost endless. I am curious to see how 4e stands up as an alternative, however. I don’t think I’ve played a monster straight from the book once after the monster builder came out. It’s so much more fun to re-skin something else, mess around with the keywords, and add a bloodied ability or some other little twist to keep the players on their toes. This is everything I have been thinking lately and not suprisingly, I have a few questions. This is hands down the reason why come spring I am switching to D&D 4e. I have been GMing another system (7th Sea) for awhile now, and mechanically it’s all completely unbalanced. I am drawn to being able to change the creativity of the flavor ANY WAY I want, and have that solid, mechanical balance already worked out. After all- I am NOT a game designer, nor have I ever claimed to be! WoTC has given me whet I needed, a SOLID mechanical balance with absolutely no attachment to the flavor. It’s a home brew GM’s dream. Whats to say that the Area Burst 2 “Combust” isn’t a Grenade explosion? There are a lot of possibilities. 1. Keyword interchangeability – I know that it could probably work on monsters and NPC’s alright- but what happens when you start switching around damage types on, say a wizard. What if you turned ALL of a wizards damage types into Lightning damage and then took up a feat that amplified all lightning damage? A. Does such a feat even exist? and B. Doesn’t that throw the balance off all of a sudden? 2. Defense Type Interchangeability – My example above, Combust, which is a Area burst 2 within 20. If I was to create a modern 4e game using the mechanic’s of a DnD class, hurling a grenade wouldn’t be an Intelligence vs. Reflex. I’d think it would be more of a Dex vs. Reflex. So what happens, (even in the Dino example of you switching it to target Will instead of Reflex) What types of considerations do you need to make in order to switch around attack types and targeted defenses? Also- is that a feature on The Monster Builder, being able to switch around the flavor text? (Not subscribed to DDI yet) If so- they should DEFINITELY do that for the character Builder. That would be great. Those printable power cards are already amazing, how cool would it be if you could further customize them? Right now, I’m running an Urban Arcana” game using D&D 4e to create a modern day D&D world. I have all the players keep keep all their stats the same, but reflavor their powers and their equipment to create modern characters. We have a Fighter who’s a Riot Squad Police Officer, a Bard who is a Street Musician, and so on. In one game, I had a couple of the players stumble into a gnoll lair. I hadn’t looked up gnolls before they did so, and so I didn’t realize that gnolls were such high level compared to the characters. They would have gotten their asses kicked. So what did I do? I simply used the stats for goblins, allowing the heroes to mow through them. We use a ton of homebrew and hand-waving to make everything fit. Everybody starts off with a fluff concept– so, say, “flying fire-thrower” named “Hotshot”. Then, we look at the different classes and figure out which one works the best for their concept– do they want to focus on single-target blasting (Sorc or Warlock), or multi-target blasting (Invoker, Ranger)? They pick a class they can work with, and I let them pick an “element” keyed to their character (so, Fire for this character) and decide whenever they get a power whether they’ll use it as written or change it to their keyed damage type. The powers all get renamed to something more in line with their fluff. Equipment, races, and anything else unfluffy for superheroes is “transparent”. Your character sheet has a longsword, but your character has two open hands. Your race is Dragonborn, but unless you want to, you don’t need to look like one. The loot they pick up, instead of being actual weapons and armor, are lessons and techniques learned through their adventures. To bring the characters beyond D&D PC power level, everybody gets one bonus “super feat” to reflect their powers. Super feats could include flight, super jumping, energy absorption-and-release, phasing, the ability to integrate tech into your body, or whatever. The super-feat is always custom designed, and helps them feel truly super. Well done NewbieDM, well done. Your post perfectly encapsulates why so many of us loathe 4th ed D&D. 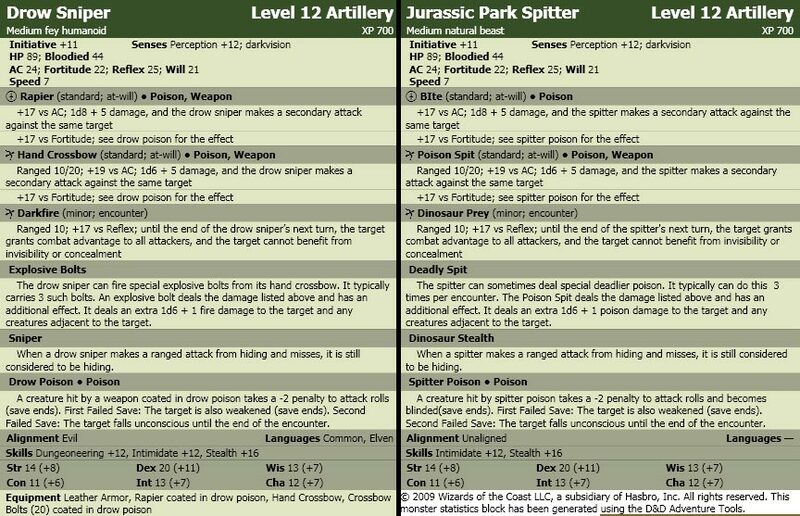 According to 4th ed as you explain it, there is absolutely no intrinsic difference between a Drow Sniper and a Dilophosaurus spitter from Jurassic Park — the only differences are cosmetic. It’s all surface and no depth when a Drow Sniper and a spitter are identical in every way except labels and “skins”. By your explanation, 4th ed. should appeal only to people who believe that the cover of the book matters but not its contents. After all, the contents of the Drow sniper and spitter are identical save for a quick “reskinning”. It’s an approach to gaming based in superficiality and a shallow perspective that can treat drow and dilophosaurus as essentially interchangeable. This is not creativity, and this does not reward creativity. It rewards life as driftwood, lying on the surface and disrespecting the idea that depth might matter. So, I’d argue that many of us agree with catdragon, which is one reason why 4th ed. has never had the numbers supporting it that AD&D and D&D 3.0 and 3.5 had.